The Occasions Catalog and Sale-A-Bration started yesterday!!! I love this time of year. Every time I buy something, Stampin Up lets me pick out a free goodie. Who am I kidding? I usually get at least two free goodies because I usually can’t decide which item I want free so I buy enough to get two (ok, maybe three) free. So, here’s how it works: spend $50 pre-tax and shipping and you get to pick out one item for free. Spend $100 pre-tax and shipping and you get two items for free, and so on. You can also get more free goodies by hosting a party. For parties totaling $250 or higher, you get an extra $25 in free products in addition to the normal hostess benefits. A party can be a true party (get your friends together and I’ll show you how to make a couple simple cards), a catalog party (gather a couple orders from friends and put them all together in one group), or a party of 1 (admit it, you’ve spent $250 on crafting products before). There’s also a third way to get extra goodies: sign up to be a Stampin Up Demonstrator. Our starter kit usually costs $99 but you pick out $125 worth of products. During Sale-abration, you get an extra $30 of free products on top of that. So that’s $155 worth of products for $99 and it all ships for free! What comes in the starter kit? Whatever you want! YOU get to pick out all the items. Not sure you want to be a demonstrator and do all the “work” that comes with it? If you decide it’s not for you, you still keep your starter kit and any products you purchased with your demonstrator discount along the way. Some sign up to be a demonstrator just to get their products at a discount and some sign up to make some money. It’s your choice what you do with it. I’d be happy to talk to you about the benefits of being a demonstrator. On to the card! 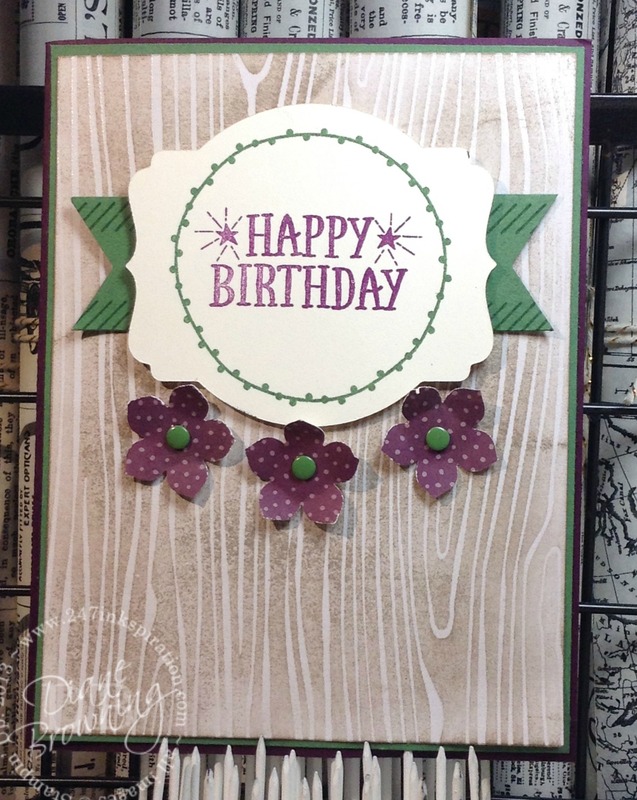 This uses the brand-spanking-new stamp set You’re So Lovely and our Color Me Irresistible Designer Series Paper. The paper actually comes white on white. I used my Chocolate Chip stamp pad to ink the cardstock, which gives the oh-so-pretty woodgrain look. Other colors are Blackberry Bliss, Garden Green, and Very Vanilla. Punch out a couple flowers and add some Garden Green Candy Dots in the center. I used the Deco Label die to cut out the sentiment. Did you know there’s a trick when you’re cutting out stamped images with the thinlet dies? Stamp your image first, then center your die over the top of your image, tape down, and then run it through your Big Shot. When you stamp first and cut second, your image should be centered right where you want it. I use Post-it tape to hold down my die. You could also use actual post-its or even washi tape. You want to use something that won’t leave residue or rip the paper when you pull it up. Washi tape is really good for this because it’s repositionable and you know you’re hoarding more washi tape than one person can use in a lifetime. Use it already! Here’s that same exact card, but using the Happy Birthday stamp instead. Now I have more cards for my stash and a thank you card and a birthday card are a great addition. I always need those! By the way, you’re probably wondering what the free stuff looks like. You’ll want to check out my Online Store and look for the tab marked Sale-A-Bration. All the goodies in this mini catalog are FREE. There are even some suggestions on cards to make and a shopping list next to each project to help you put together your order. And I’m always here if you have questions about products or need help deciding between a couple different things.